One of the biggest questions I had going into my internship with College Works Painting — where college student essentially run all elements of a residential painting business over the summer — was how were we going to get customers. On the first day I training, I found out the answer: cold calling. I didn’t want to go door-to-door. Not that I was above it or anything, it was just a terrifying thought for an introvert like me. But years later, I can look back and say it was a really valuable experience. Here are the 5 biggest things I learned from cold calling the suburban streets of Renton, WA. I remember driving to my assigned territory for the first time and parking my truck in what looked like a promising neighborhood. There I was, I was going to be the annoying salesman interrupting families at their homes. Could I really do it? I had no other choice. If I wanted to succeed, no one else was going to go out there and get customers for me. It was an uncomfortable and awkward predicament. I probably sat there 10 or 15 minutes before mustering the courage to finally get out and ring that first doorbell. Thankfully the entrepreneurial drive won out over the painful shyness. And you know what? Contrary to popular belief, talking to strangers is not life-threatening. Not everyone was happy to see me (in fact, most people weren’t), but most were polite enough to hear out my pitch. No one slammed the door in my face. And even if they did, would that really be the end of the world? I mean, was I such a weak character I couldn’t handle a little rejection? On that first day, I scored a couple hot leads and eventually closed one paint job. Not bad considering the mild panic attack that almost hindered me from getting out of the car. 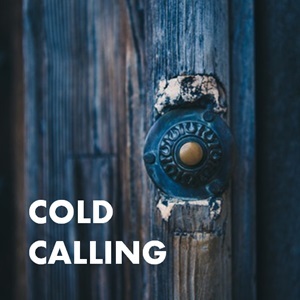 Cold calling is a numbers game. A certain percentage of houses will get painted each summer. If a paint job lasts 10 years, that number could be as high as 1 in 10. With each “no” I got, I knew I was one step closer to finding a “yes.” The “yes’s” were out there; it was just a matter of finding them. In that sense, you could position cold calling as a treasure hunt in your mind to make the task seem less tedious. It was my little attempt at gamification. Cold calling is a process of elimination. With each house you cross off, your odds improve with the next one, right? During training, our sales coaches were adamant we hit every house, no matter how good the paint looked from the curb. I though that was an idiotic waste of time. Why should I bother talking to someone who was very clearly not in the market? Turns out there was some method to this madness. First, you never know what the sides or the back of the house look like. Of course it’s highly unlikely they only painted the front, but you never know. I booked several jobs from people whose houses looked beautiful. One was a new owner who just couldn’t stand the color. And second, you never know who the homeowner might know or how many other houses they might own. I came across several real estate investors by walking up to nice-looking houses and scoring estimates on their rental properties on the other side of town. Start the conversation. Make the connection. Most of the time it won’t lead to anything, but it costs you only a short amount of time and can pay off very well. I figured the excited college kid running up to the door would look more like someone worth talking to than the guy slowly trudging up the driveway with the clipboard. I could cover more ground faster. It was partially about efficiency. Even if I didn’t get any leads, I could at least get some exercise. What small thing can you do to convey enthusiasm to your customers? No matter how you spin it, cold calling still isn’t that much fun. It takes a thick skin and a lot of time energy to find a few qualified prospects. So in my second year of the painting business, I was determined to keep the cold calling to a minimum. One thing we did differently was to take out a booth at the Seattle Home Show. A last minute dropout to the show opened up a booth spot on the floor that we picked up for just $2000. From that spot, we were able to book more than $70,000 worth of work for the summer. By switching from a “push” marketing tactic to a “pull” tactic, in which pre-qualified customers proactively came to us, we generated a massive ROI both in terms of dollars and in terms of time.